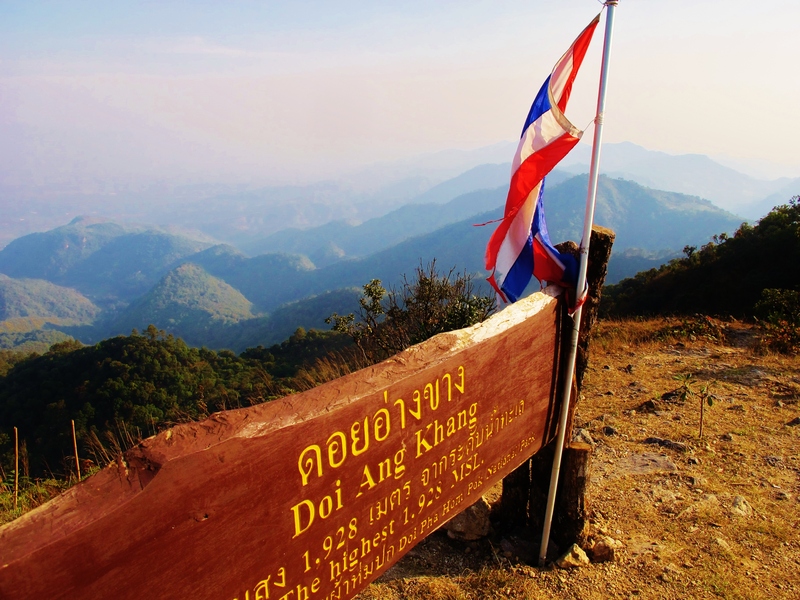 1,928 meter high Doi Angkhang may have fallen from grace among birders in the last few years due to the increasing accessibility and popularity of nearby Doi Lang, but it remains one of my favorite birding spots in Thailand. The area feels remote, lying on a dead-end road next to the Burmese border. It can get seriously cold here in winter – lows in January/February frequently drop to 3C (37F). Birding can be tough, with many of the specialities both scarce and elusive. I remember clearly my first visit in May 2006, when it took me nearly three days to find Scarlet-faced Liocichla – luckily this beautiful species is somewhat easier to find in winter. My day started before dawn at Chiang Dao, where I heard four species of owls (Mountain Scops Owl, Collared Scops Owl, Brown Hawk Owl, and Asian Barred Owlet), but saw none of them. However, two splendid male Siberian Blue Robins near one of the temple buildings made up the lack of owls. After breakfast, I drove the 90km “back way” to Doi Angkhang, via Arunothai and the Burmese border. The road is in fairly bad shape these days, but still it’s an enjoyable drive, with the mountains of Burma forming an unforgettable backdrop. As one nears Doi Angkhang, the Chinese Cemetery is an essential stop, as it’s a reliable site for one of the local specialities – Brown-breasted Bulbul. I scored with several of them, despite it being late morning and there being little else around. After checking in at the Angkhang Nature Resort (my splurge after three nights in bare-bones accommodation at Malee’s in Chiang Dao), I headed uphill once again to the trails near Km 21. I love birding this area, as it brings back many fond memories from visits past. As soon as I entered the forest today, nearly the first birds to greet me were several inquisitive Scarlet-faced Liocichlas. They were in nearly the same spot when I finally connected with them for the first time in 2006, when I sank to my knees with joy after nearly 25 hours in the field looking for them. The summit of Doi Angkhang has one of the finest views I’ve ever seen, and it’s a proper mountain summit, a pointed peak at the top of a ridge surrounded by big drops on all sides. It’s well worth the heart-busting 20 minute near-vertical climb to get there. Year ticks added in the summit trail area this afternoon: Scarlet-faced Liocichla, Silver-eared Laughingthrush, Lesser Racket-tailed Drongo, Mountain Bulbul, Black-throated Sunbird, Mrs Gould’s Sunbird, Claudia’s Leaf Warbler, Chestnut-crowned Warbler, Mountain Tailorbird, Rufous-bellied Niltava, Little Pied Flycatcher, Spectacled Barwing, Golden-throated Barbet and Pygmy Wren-Babbler (total 346).